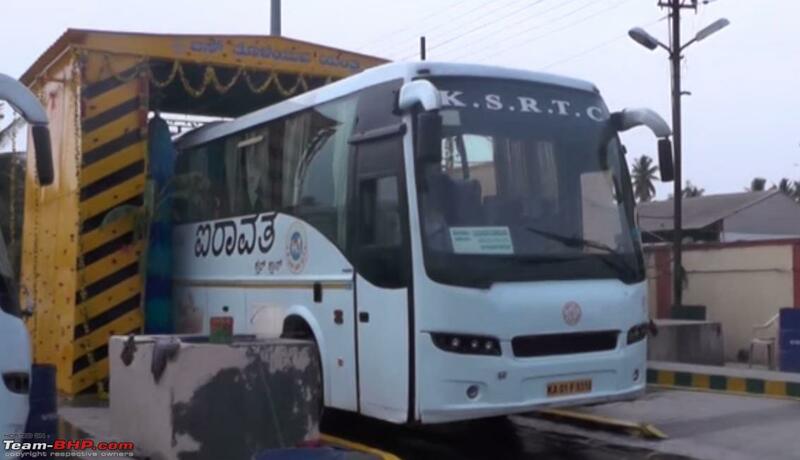 The Karnataka State Road Transport Corporation has recently installed an XL-size automated bus washing machine for its fleet of buses. The first machine has been installed at the Shanti Nagar Bus Depot in Bangalore and operates 121 schedules with 128 Volvo buses. The machine uses 6 brushes on either sides and one for the roof to clean the bus surface. Additionally, soap and water jets will be sprayed on the buses to ensure the are exteriors are clean and shiny. It can wash one bus at a time, every 7 minutes. The cost of this machine is approximately Rs. 6.9 lakhs. KSRTC plans to set up such machines at other bus depots in the near future. Last edited by S2!!! : 19th June 2015 at 18:15. The cost of construction actually seems quite cheap considering the scale KSRTC operates at. If the machine proves cost effective over a long term on a per-wash basis, they can even commercialize it by allowing private bus operators to pay for a wash. Thanks for the information S2!!! Rs. 6.9 lakhs is really a very reasonable price for this machine. If the consumables (like brushes) are replaced timely and routine maintenance is done properly, the machine shall last long too. I commute Pune - Bengaluru - Pune few times a year. 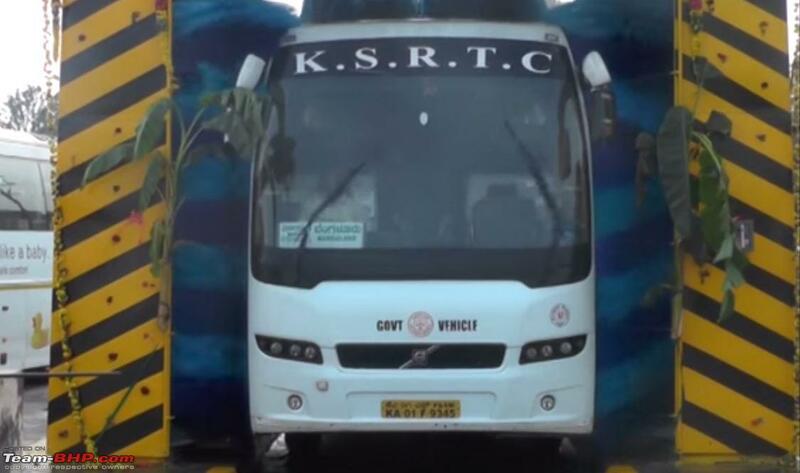 And I prefer to travel by KSRTC Volvo. I start from Pune at 5 pm and get down at Majestic at 7 am after a peaceful sleep. It is better than waking up at 3 am to take an early morning flight. Looking at the proper and professional way these interstate Volvo buses are operated by KSRTC, I am sure they will maintain this washing machine well. 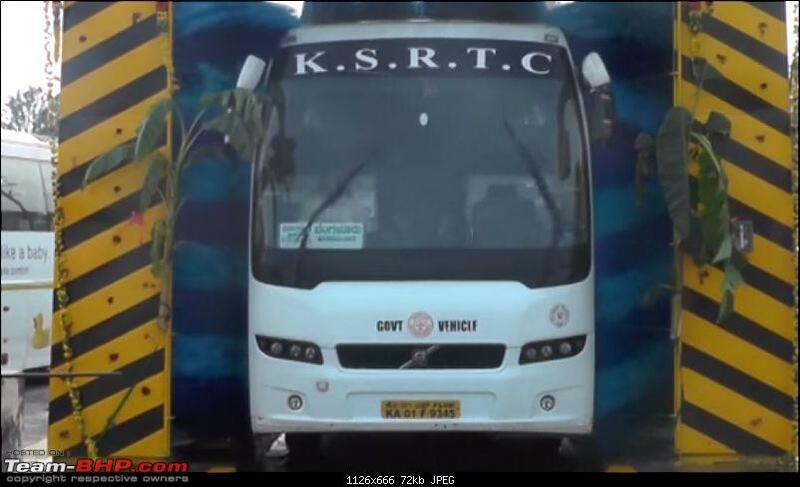 I have seen KSRTC volvos suffer from hard water marks on their windshields. Given the mammoth front windshields and the difficutly in navigating with a stained windshield against blurting high beam oncoming traffic, I really hope they use treated water for washing. The pessimist (or is it the realist) in me says that the machine will left to rust in about 6 months either due to improper maintenance or due to unavailability of spare parts. Another government white elephant.. I will even venture out to guess that the company which supplied it is somehow tied to the upper management of KSRTC or some karnataka politician.. I understand that I am supposed to be optimistic and hope for the best but the track record and the past do not give me any such hope. I know bangalore citizen matters covered this some time ago. I hope they do a followup after 6 months . A good initiative. Public Assets= Dirty Assets is a mentality that we must move out of, and yes, for that we have to pay for sure. I hope the right minded citizens of Bangalore will use RTI to keep the authorities under supervision and make sure this is not wasted away. IMO, letting private operators pay and use this facility, as another member suggested in the post above, is a great idea. I can understand where you are coming from, but in case of KSRTC and BMTC, they are a rarity. They are among the rare government units that make profit. 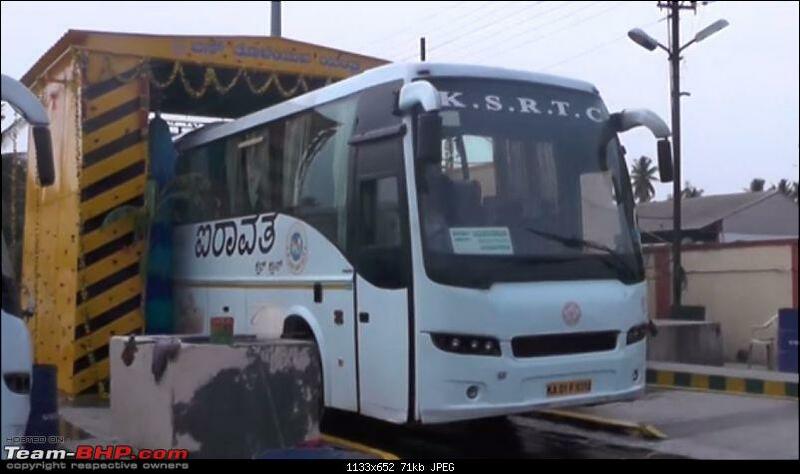 The other two corporations — KSRTC and BMTC — are also run like professional organizations. "We have an automatic fare revision system since 2002 and we don't need to get political approval every time. 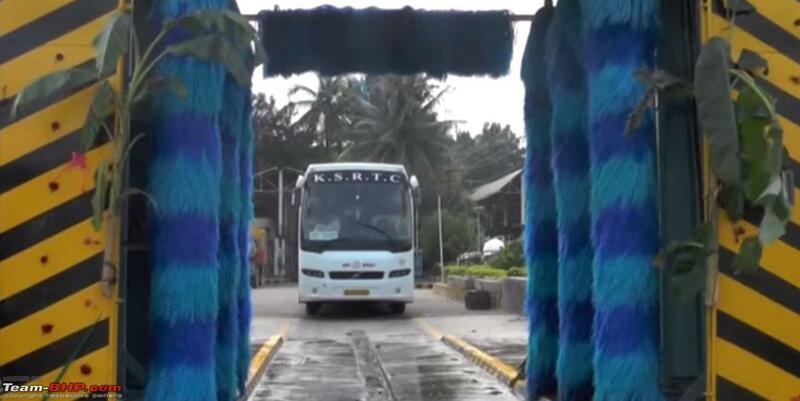 Even after paying Rs 30 crore as income tax we have registered profit," said KSRTC managing director N Manjunatha Prasad. Not sure about KSRTC , but BMTC was in the news recently. They had reported that BMTC was a loss making organisation due to heavy operating costs and wide spread corruption. IIRC , I saw a similar washing facility in Koyembedu last year for washing TN local and interstate busses . The machine was not working properly , I noticed people using pipes to wash the busses. That happened last year, and the politicians are fighting over the cause. My original link was from 2013. I had seen similar wash machines in other KSRTC and BMTC Depots a few years ago (seen while traveling in buses from the road). However those had one brush each on both sides compared to the new machine's 3 and the old one did not have a top wash. I remember reading a newspaper report in Kannada which highlighted this difference between the older machine and this new machine. I wonder how were they washing the buses all this time? I doubt on the maintenance part while comparing the maintenance of the volvo buses itself and the old machines, very few are on proper condition, probably the mechs are yet to touch them. Once done, you can clearly see the quality of workmanship. Last edited by ::CMS:: : 22nd June 2015 at 13:17. Did i hear right, 6.9L is cheap. At 2014 component expo, Pragati Maidan, I got chance to speak to few executive from abc company (do not remember name accurately) & the quote for installation given was 25L - 30L + free maintenance for some x years. That was for PV vehicles but has provision for front & rear & wheel wash. In fact they are the one to set up & maintain the car wash near HSR BDA complex. I've seen this in Srinivaspur Taluk of Kolar District almost 4 years ago. As addyhemmige posted, its was the old type with 2 brushes. I appreciate KSRTC for this. This is probably the only state-run bus service which even "considers" quality-of-service and passenger comfort when planning their investments. However, I have a big axe to grind with them, as they are penny wise and pound foolish. Here's why : Inorder to extract the last bit of mileage, they drive fantastically slow & more detrimentally, are masters of engine lugging even at the lower speeds. Whatever the corp saves from fuel, they must be paying multi-fold for clutch & drive train repairs.